414 p., 15,6 x 20,9 cm. Heinrich Gustav Hotho (1802-1873) is known primarily today as the editor of Hegel’s aesthetics. His autobiography, which was published under the descriptive title ›Vorstudien für Leben und Kunst‹ (Preliminary Studies for Life and Art), is in two respects an historical and a conceptual link. On the one hand, it acts as an intermediary between Hegel’s aesthetics and its transformation in Hegelianism, and on the other hand between philosophical aesthetics and research on art history. For Kierkegaard, the ›Preliminary Studies‹ became a source of information for creating an aesthetic approach to life. 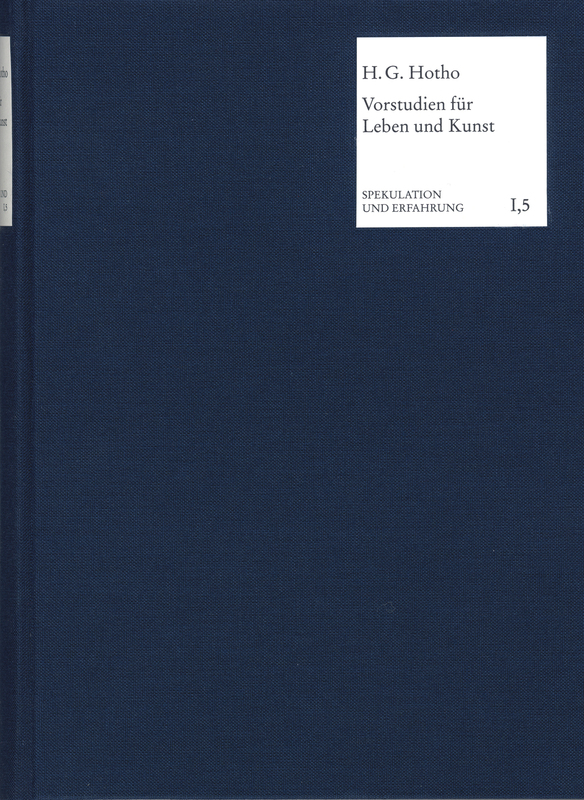 This work, in which Hotho tried out his method of a »speculative art history« for the first time, not only provides insight into Hotho’s interests in aesthetics and cultural policy but also into the beginnings of the German history of art, literature and music. This new edition contains a detailed introduction, written by the editor, indexes of names and subjects and a comprehensive bibliography which also lists current research literature on this subject.